What is it about August that gives me this unquenchable desire to shop? It must be all the Fall things rolling out, combined with all the great end of summer sales, and the whole fashion world buzzing - becuase I can not keep my damn wallet closed. Again. It was last August, I was feeling disgusted by my shopaholic tendencies that I decided to instate my monthly budget. Which, some months I've stuck to, others I've unapologeticly gone over, and while I've been trying to force myself to consider purchases more carefully, I'm still prone to impulse buys. Not to say that I haven't made some really good purchases this year. I got my brown leather fold over Lucky Brand bag that I'll be carrying for years to come; I got some absurdly comfortable neutral sandals that I've now worn 17 times, a starfish cuff that is undeniably awesome, scalloped hem shorts I'd been coveting for a year, and the Stormy Sea necklace I'd been coveting even longer. 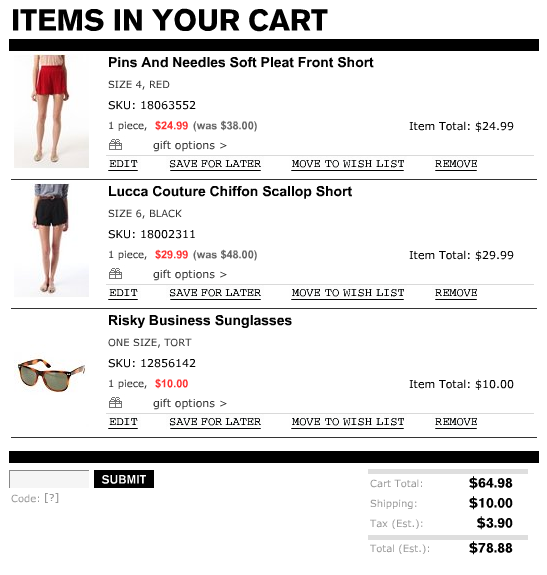 Last August I had a cart full of stuff at Urban Outfitters I wanted to buy, but didn't. You know I still wish I'd gotten those darn red shorts. 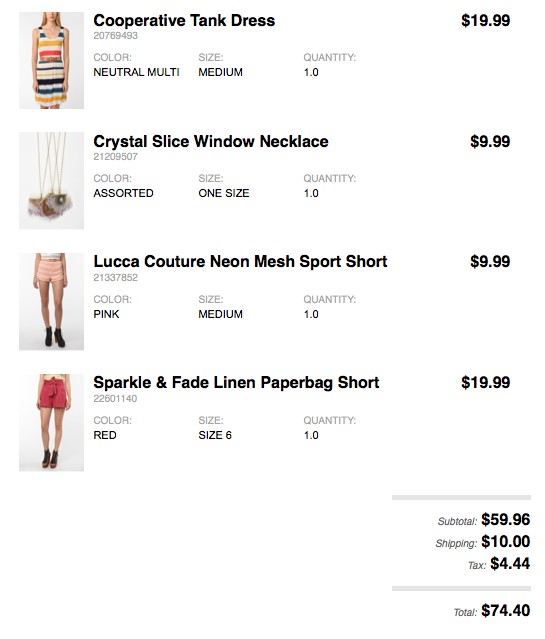 So this year when faced with that cart at Urban, I decided to place the order. Only the item I want most, the striped dress that reminds me of the Marc by Marc Jacobs dress (a little) didn't ship! Why is my cooperative tank dress on back order, and what the the chances that it will ship? I was really looking forward to that dress, it reminds me of the Marc by Marc Jacobs dress that I could never afford, and I wanted to wear it with my cognac wedges and orange cross body bag and straw hat, and my heart sunk when I saw it wasn't shipping. Is there any hope of getting it? Today I was caught between a wet and a shopping place, and you know that I chose to shop. Yes Vanessa, You are to blame. Shopaholic's looking very chic in that London Fog trench. I do wish you get the striped dress in the end! agh! That darn cart at UO>>> I hear ya! Love the chevron dress at Gap, though. Is that F21 skirt a recent buy?? I love it! Yay for new goodies, nothing like a bit of shopping for a pick me up. You look so classy in that trench coat and leopard print! Your letter to UO's customer's service was pretty hilarious, I sure hope you will be able to add the tank dress to your closet though! It's a beauty. Such a cute look. I adore that skirt and your trench. Perfect for the soon to be changing season. Also, I know what you mean about going crazy with shopping in August. I have done way too much damage to my budget this month! Plus, I've purchased at least five things that I won't even be able to wear for another month! I am soo with you on the impulse shopping. It's funny because I've done that with me when I thrift! There was a day where I was on a major craving to just raid a thrift store and it just so happened they were having a massive sale. And by the time I got to the cashier...whoops. $90 of stuff. Uhhh...doesn't look I really thrifted, even though I got a TON of stuff. Oh well, at least my money was going to a charity rather than...wherever my money goes to when I shop retail. First off, I really like that tank dress and hope you get it soon. Secondly, I love that skirt on you! You look so great in it with that camel trench. I can't wait for fall!! i love that UO tank dress and i really hope you get it in soon! i also bought a few items during the UO sale and my August budget isn't looking so good either... and you look so chic in the trench! Hahah that email's super funny. I didnt know that back ordering at urban outfitters meant that you might not get it. I hope it ships soon!! I have the shopping bug too at the moment. I definitely think that it is the change of season - it is winter here and I think Spring shopping makes me think it will come quicker. I love these rainy pictures and the warm colour palette! Everyone should have a trench, they look so elegant and chic. I hope your email finds a sympathetic reader who digs up the dress for you! Hello my dear friend, nice to be back to be able to see all your summer delights. Umm...LOVE your outfit! So classy!! Gosh, that's a nice shopping outfit. 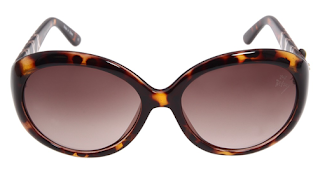 And it looks like you scored some very good deals - especially those sunnies. Are you at an outlet or a shopping mall? Either way, I'm jealous. From one shopaholic to another...good work! Don't feel bad about the shopping ban. I have no willpower either! You look great in this outfit, especially the leopard skirt and the trench. Very classy! haha you are hysterical! love your finds, and am so sad for you that the dress is on back order. Keeping fingers crossed for you! Great finds (though $10 shipping?? OUCH!). Really well put together outfit, looks great on you! Thanks for your comments, I hope you stop by again soon. I have the same problem in August! I can't help it...I love the way it feels to be buying my fall outfits. Though I'm still primarily a thrifter. I hope you get that dress, it's super pretty! I love that email that you sent! And that's a seriously great shopping outfit - so chic...and wow that Gap dress is pretty. Hey, at least you're doing damage at an outlet mall :) And I think the monthly budget, even if you don't always stick to it, has at least gotten you to really evaluate your purchases. So even with a few impulse buys here and there, you're probably doing better than a year ago. I love your rainy day outfit photos! You're making rain look so chic! The striped dress is so adorable. I hope you get it soon. Love love what your wearing especially that trench coat. Super CHIC!! I, of course, love the dress! (And you got it for $2 less than what I paid for it!) You look adorable in it, and it's certainly the most comfortable dress I've ever worn. (Love the drop elastic waist,too!) I'll be eager to see you work your style magic to it! And, I was laughing (but definitely not rolling my eyes) at your letter to U.O. I hope someone takes pity on you and answers the call! I love your email - I sent a similar one when a pair of shoes I ordered never arrived, I was gutted! Love that Gap dress, gorgeous. This post was amazing :) But it has made me want to go shopping like no tomorrow! The letter you wrote to Customer Service cracked me up by the way! Hahah I love that you e-mailed customer service and explained to them how you would style the piece! I love all your new purchases- and such bargains you really couldn't pass them up! Great leopard print skirt and trench! Really great group of classy picks! You're right on about Fall--I have my eye on quite a few lovlies myself . . .
What a timeless chic look! Trenches and blazers are my favorite items to wear in late summer and fall. We all have our shopaholic moments. I'd love to get a bunch of new items for the next season, but it's so not in the budget! I am the same way about August shopping. I think my brain is wired for shopping in August from all the years of shopping for school clothes. I love your shopping outfit with the trench. Very lady like. shopping is always fun, but especially at back-to-school time! Wow, you look beautiful with that outfit, Love your skirt and coat, I am totally wanting that skirt. I like your outfit! I'm seriously considering that J.Crew leopard blouse because I think it's in danger of selling out. But I shouldn't. Especially not for $78. Sometimes I tell myself that I have a budget, although I never name numbers. I'm more likely to just ban myself from buying anything for a random amount of time. Omg this post could have been written by me. My boyfriend always says how I complain about money but then I always buy new clothes. Such a problem! I've really been fighting the urge to shop too--I think it's all the fall clothes coming in and summer sales. The only thing that's been holding me back is the fact that I haven't had time to shop! That outfit though, wow, what a classic, stunning look! I love it! Love this outfit - I can't wait til I can sport my trench again! Ahhh. You are too cute. I'd so write an email like that and then never check my email for a month, afraid of their response. I totally know what you mean about the desire to shop rearing its ugly head in August. More so than normal, too. And I do agree with you: it's because of all the new fun fall stuff coming out. I haven't bought a THING this month, and I'm determined not to. I always make the mistake of shopping for fall stuff too early...before fall even rolls around...and by the time it actually is fall, I'm tired of it, because I got such a jump start on it. Does that make sense? Of course it does. I've made a point of ignoring websites that sell stuff, although I must admit, I looked at UO the other day. I started looking at their sale stuff, and then when I realized I had 80 some pages to go through, I said, "screw it, this is a waste of time," and ex-ed out the window. What is happening to me?! You look sooo classy in that trench ! I love the detail of the white top!